Watching From The Rooftops As A Fierce Syrian Battle Unfolds : Parallels Syria's government appears to be making gains this week against rebel forces in a hard-fought battle. This comes as Lebanon's Hezbollah sends militia fighters across the border to bolster troops loyal to Syria's President Bashar Assad. 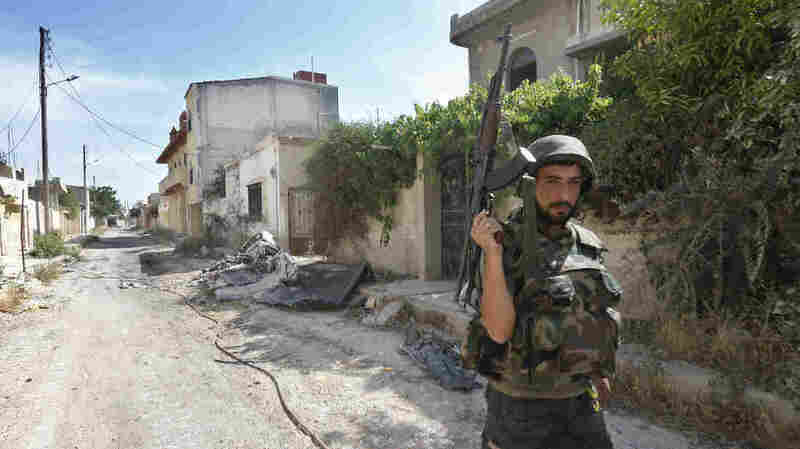 A Syrian soldier walks through the hotly contested city of Qusair on May 22. The Syrian army, backed by Lebanon's Hezbollah militia, has been waging a fierce fight with rebels in the key western city for the past two weeks. Syria's government appears to be making gains this week in a battle against rebel forces in the key city of Qusair, along the border with Lebanon. NPR's Steve Inskeep traveled to the edge of the city, and we hear from him first, followed by Kelly McEvers, who reports from just across the frontier in Lebanon. A Syrian provincial governor told us this week that the government army has largely retaken Qusair, though a battle continues for the airport. We asked to see for ourselves. So the governor appointed two men to lead us to the city, which holds great importance because it is a busy crossing point with Lebanon. The drive proved to be revealing. Miles before reaching Qusair, we saw towers of smoke in the air. From across a lake we made out Qusair's airfield, the scene of the heavy fighting this week. It should have been a short drive to the city, but we took a roundabout route. Our guides, members of Syria's Alawite religious group, explained this was for security. President Bashar Assad is Alawite and depends on the group for his firmest support, though they make up just a little more than 10 percent of the population. The guides were taking us from one Alawite village to another, fearing violence if they drove through villages of the majority Sunni Muslims, many of whom support the rebellion. As we drew closer, we heard the thud of Syrian artillery, pounding Qusair. We also heard fighter jets overhead, and occasionally heard small arms fire. And yet even when the gunshots sounded as if they were close by, we would still see children sitting casually on the side of the street. We were finally stopped by soldiers at a checkpoint, and they said we could not enter Qusair, telling us that rebel snipers were on the road ahead. Unable to get closer, we knocked on the door of a nearby house, and the residents let us climb on the roof. We had a panoramic view of the landscape. It did not look like Qusair was entirely under control. We saw smoke rising up from the city, suggesting the fighting was still going on. The rebels have said they're still fighting in the city, though spokesmen for both sides say the Syrian army has captured most of the region. In this battle, the government has supplemented its heavy weapons with help from the outside. Fighters from the Lebanese Shiite militia Hezbollah joined the battle from across the border with Lebanon. It's a sensitive topic here to discuss Hezbollah's involvement in the war. The government has insisted it's the rebels, not the Syrian army, that rely on foreigners. But Hezbollah's involvement has become more open in recent days, and Qusair is especially well-placed for the Lebanese militia to play a role. 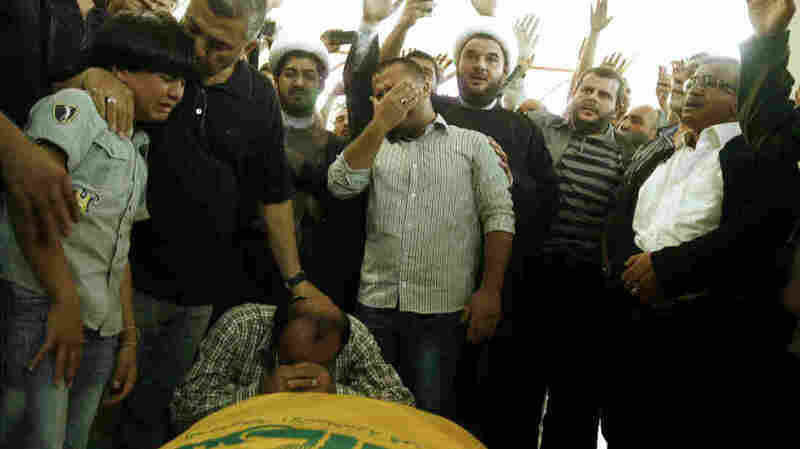 Relatives of a Lebanese Hezbollah fighter grieve at his funeral in the southern Lebanese port city of Sidon on May 22. Hezbollah fighters have been supporting the Syrian army in its battle against rebels just across the border in Qusair, Syria. We're standing on top of an unfinished house in the town of Hermel, Lebanon. It's basically bare concrete with rebar sticking up. And I can see into Qusair, just beyond a berm that forms the border. Hermel is called the city of martyrs because it is a major stronghold for Hezbollah. In the past, Hezbollah fighters from Hermel have fought against Israel. Lately, the town has hosted funerals for fighters killed just over the border in Syria. The latest battle for Qusair started about two weeks ago. Residents say Hezbollah sent men to help the Syrian army take back the town from the Syrian rebels who have been fighting for roughly two years to bring down Assad. Hezbollah's mission seems to be stopping the supply of rebel guns and fighters coming from Lebanon and going into Syria. At a funeral for three Hezbollah fighters who died in Qusair, their comrades celebrate what they believe is an honorable way to die. Judging by the number of these funerals in recent days, the fighting has been fierce. But in recent days, Syrian government officials and Syrian rebels have said the government and its Hezbollah supporters are beginning to gain the upper hand. Qusair residents who recently fled say government and Hezbollah fighters have cleared out most of the villages around Qusair city, taking an airbase outside. We met a woman and her children who said they were caught in the first phase of the battle. They fled their own village, then took refuge in a second village. As the army prepared to take that one, they were caught at a checkpoint. "I was surprised to see a checkpoint. And I didn't know what to do. I decided to act naturally, because if I start running away, they would shoot at me," the woman said through an interpreter. But they shot anyway, she said. "So there was a moment of chaos. I was busy with the children. I didn't even notice that Alaa was wounded," she added. Alaa, her 14-year-old daughter, had most of her jaw shot off. It has since been partially reconstructed, but she still has great difficulty in speaking. Once the Syrian army and its Hezbollah backers cleared the villages, they formed a ring around Qusair, manning that ring with checkpoints and trapping civilians and rebel fighters inside. Three days ago, Em Hassan and her husband and children fled Qusair and made their way to Lebanon. They are now staying in a building that used to be a slaughterhouse for sheep. Refugees have put up tents on concrete floors over built-in drains designed to remove the blood of the slaughtered animals. Em Hassan says she first had to sneak out of Qusair, then had to pay the equivalent of hundreds of dollars to a network of smugglers to reach Lebanon. Em Hassan's relative is a smuggler who's taking money to get people out of Qusair. He says there are some 15,000 civilians trapped inside the city. A YouTube video shows a doctor who says he's in a rebel field hospital in Qusair. He and his team operate on what looks like a ruined leg. He says the hospital is running out of supplies, and running out of blood to treat the hundreds of people who've been injured from rockets, shelling and airstrikes. Abu Obada and his family also recently left Qusair. He tells a roomful of relatives that with no access to food and water inside the town, it could be just days before the town falls. He says the rebels should negotiate some kind of safe passage so the civilians can leave. Abu Obada says something changed when the Lebanese Shiite militia, Hezbollah, entered the fight. And it's not just that government troops gained the upper hand. "We Sunnis used to live side by side with our Shiite neighbors," he says. "But now that Hezbollah has come to our villages, we had to leave. People say they will burn us and slaughter us with knives." Now it's a sectarian war, Abu Obada says. And we can never again go back to the way it was.